Rusutsu Resort is about a twenty minute drive from Tanuki Lodge and divided between 2 main areas – West Mountain and East Mountain. 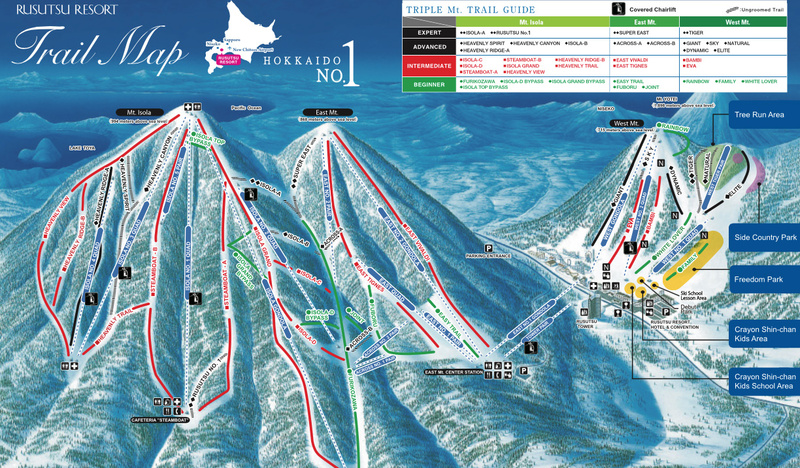 Rusutsu has thirty-seven ski runs, three gondolas and fifteen chair lifts. East Mountain is the highest peak in the resort with the largest area ski area while West Mountain is better suited to families. A gondola joins the two areas. Rusutsu caters primarily to a domestic market in comparison to Niseko United. Coming from Tanuki Lodge you can park at the base of either East or West Mountain. There are plenty of restaurants, shops and facilities and the runs will be a bit quieter than over in Niseko. You can find out more about Rusutsu Ski Resort .